Entrepreneurs and developers are paying closer attention to downtown Salem, just as the city is investing more public money into the area. "We're open for business," one city official said. 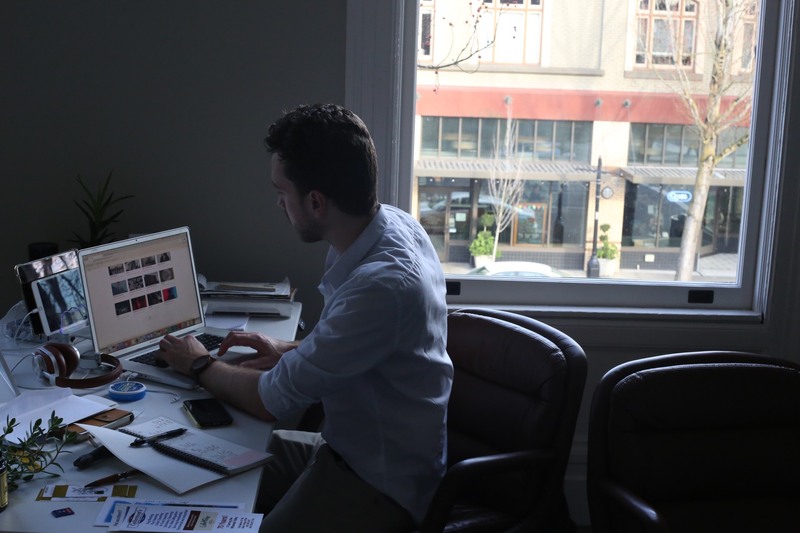 A coworking space isn’t what Scott McLeod expected. It took decades for him and his co-owners of The Gray Building, a 120-year-old building on the corner of State and Liberty streets, to make the needed repairs to its second story to lease any tenants. By the time they spruced it up, their expectations had aged a little, too. “We thought our tenants would probably end up being law firms or accountants,” the 70-year-old retired teacher said. That tenant is The Gray Lab, a sort of ad hoc office where people rent desks instead of leasing entire offices. It's not the only coworking space in Salem, after Co.Working and Atrium Coworking. The business model is common in bigger cities, teeming with freelancing creatives and remote-workers. But those workers are arriving here in Salem, as well, as downtown changes. While coffee shops have always been part of downtown’s orbit, stakeholders in the area say more service business, creative agencies and apartments are arriving to meet a new class of workers. Entrepreneurs and developers are paying closer attention, too, thanks in part to less expensive real estate than what’s offered in metro areas along Interstate 5. Salem city government itself is investing public money to facilitate growth. “We’re open for business,” said Sheri Wahrgren, downtown revitalization manager for the city’s Urban Development Department. Wahrgren said in an interview that downtown is as busy as ever during her 15 years in the department, thanks in part to the strong economy, which has opened up up lending. “I think the reason we’re seeing this movement is we have more capital,” she said. Public dollars are helping, too. Over the past five years, the Urban Development Department has given more than $6 million in grants to private developers for new construction, repairs, and façade improvements. Last year, $1.5 million in public dollars went toward an estimated $6.3 million worth of private development in downtown, according to the department. One of those projects was The Gray Building. Like downtown, the space today is a collision of old and new. Walls of The Gray Lab, which occupies most of the second floor, are a sterile white – the most noticeable decoration is a crisp, hexagonal ‘G’ logo designed in-house. The coworking space will open this spring and already has a waiting list, said Bryon Neal Daniels, co-owner of The Gray Lab. He said he’s not surprised. The Gray Lab offers two other spaces for rent on the second floor of the historic building: a conference room and a photo studio, which opened in January. Daniels said the studio is booked solid by local marketers and photographers. “We knew there was a need. First week we launched, we had bookings coming in. It’s been really busy. I don’t think either of us expected it to take off as quickly as it did,” he said, referring to co-owner Logan Martin. Daniels and Martin both run separate creative agencies and share an office near The Gray Lab, overlooking Liberty Street. Across the way stands Archive Coffee & Bar, whose website Daniels' creative agency helped design, and one of the many eateries they frequent. Jesse Hayes, Archive’s 31-year-old owner, said a rise in foot traffic downtown has given would-be restaurateurs more courage to open. Hayes wouldn’t disclose Archive’s financials publicly but said revenue for the watering hole has grown every year since it opened in 2014. And its success signaled to Brian Kaufman, owner of Tipping Media, another downtown design firm, that he could get into the game, too. Kaufman, 38, opened two restaurants last year with business partners: hamburger bar Bo & Vine and pizzeria-and-wine cafe Basil & Board. The conditions Kaufman noticed mirrored his own decisions. He moved to Salem three years ago from a city near Phoenix. Aware of a migration into the Pacific Northwest from around the country, and the relatively lower cost of living, the calculus was clear. “It seems like there has been this wave forming in Salem, that as Californians come up to settle in Portland and push those people out, from a cost perspective, it seems like a younger crowd has started to land in Salem,” he said. According to the U.S. Census Bureau, the share of Salem residents aged 15 to 44 years old has not changed significantly since 2009 — at about 43 percent of residents. Downtown does skew younger than Salem at large, according to Census data. And regarding business growth, there is no readily available data. Two city departments – planners and urban renewal – said they don’t have data specific to downtown, and neither does the Mid-Willamette Valley Council of Governments. Private builders, however, often have an arsenal for market research to decide if and when a city is worth setting up shop in. Josh Kay, a commercial real estate broker with First Commercial Real Estate, said the interest from businesses to move to Salem has “transformed” over the last decade. Salem’s downtown will likely always be a little sibling compared with Portland, but the migration into Oregon is making other cities more attractive, too, he said. Space for commerce and housing remains hot. “I think people are seeking a more livable city,” he said. There are some clear signs it could stand to get hotter, however, Kay said. The roughly 60,000-square-foot site that Nordstrom left last April remains unused. He said the city could also use a grocery store. “We’ve got to have that,” he said. Gabe Johansen, principal broker at SMI Commercial Real Estate, called it a chicken-or-egg question. More shoppers are on the way. The 180-unit South Block apartments along Southeast Commercial Street opened recently. A 40-unit apartment on Northeast Court Street is expected to open this spring. Meanwhile, Koz Development, a Snohomish, Wash.-based firm, plans to build a 146-unit apartment on the corner of State and Commercial streets. Most of the units will be less than 300 square feet in size a deliberate move to cater to urban dwellings. “The general concept is smaller studio units, probably smaller than most of the residential units you’ll find in Salem,” said Joshua Scott, a Koz executive. "We see it as meeting a need and filling a void in Salem, especially in downtown where people are wanting to live," he said in a later email. Koz also has approval from the city of Salem to offer less parking than required by city code. Scott said the deal allows them to offer cheaper rent. Hayes, Archive’s owner, already lives downtown and walks two minutes to work. “I love the energy of it, being connected and kind of a part of this downtown community,” he said. Public dollars are earmarked to add to that energy. The Urban Development Department has multiple projects underway expected to add more landscaping, public seating, lighting, and, potentially, internet infrastructure. McLeod said he looked forward to the changes ahead. “There’s definitely a renaissance going on downtown,” he said. $71,215 to Suzanne M Gwynn Family Trust for upper floor improvements and business recruitment at 495 State St.
$170,000 to 2011 Commercial St. NE LLC for upper floor renovations and historic preservation at properties 201 through 211 Commercial St. N.E. $38,291 to Nate Levin for business recruitment at 702 High St.
$54,902 to JB Sunshine Properties LLC for business recruitment and expansion at 156 Front Street. $23,630 to Pioneer Trust Bank for historic preservation at 109 Commercial St.
$118,200 to CH Reed LLC for historic preservation at 189 Liberty St. N.E. $5,308 to Dalke Investments for upper floor renovations and business recruitment at 222 Commercial St. N.E. $270,371 to 440 State, LLC for upper floor renovations, mixed-use, and historic preservation at 440 State St.
$151,906 to Metropolitan Building, LLC for renovations to vacant basement space for properties at 150 Liberty St. N.E. $52,372 to MT Capitol LLC for historic preservation at 388 State St.
$16,043 to 201 Commercial St. N.E., LLC for business recruitment at 201 Commercial St. N.E. $12,745 to Equitable Center LLC for upper floor tenant improvement at 530 Center St. N.E. $28,759 to Breyman Estates for historic preservation at properties 310 through 320 Court St.
$91,712 to 494 State Street Salem LLC for upper floor renovations at 494 State St.
$110,000 to High Street LLC for business recruitment and beautification at 649 High St.
$300,000 to CH Reed LLC for preservation, exterior beautification at 120 Commercial St N.E. $15,854 to city of Salem for business recruitment at 195 Liberty St. S.E. Correction March 26 -- An earlier version of this article listed Scott McLeod's age as 64 years old. He is 70.